This winter I spent some time in the Craft Memorial Library over at Bluefield, West Virginia. I found there microfilmed copies of the Bluefield Daily Telegraph from the late 1800s to the middle of the 1900s. Interesting stories. Of course the first community to be founded was the little town of Graham, on the Virginia side. It was named after a Philadelphia entrepreneur, a man by the name of Thomas Graham, whose family had been involved in international merchandising before the Civil War, and afterwards Graham was highly interested in developing natural resources in the US and abroad. He met up with some others who had decided to build a railroad into the Flattop Mountain region to mine coal from the area’s rich seams. His ability to get the capital from northern investors to make this happen caused the locals to honor him with the naming of the town in 1883. This lasted for just a little over 40 years. The city of Bluefield developed just a little to the east, and across the state line. It’s name comes from natural features. Some say it reflects the presence of a wildflower called Chicory, which has an azure blue flower. Others think it has some relation to the Bluestone River and its limestone rock which flows through the area. 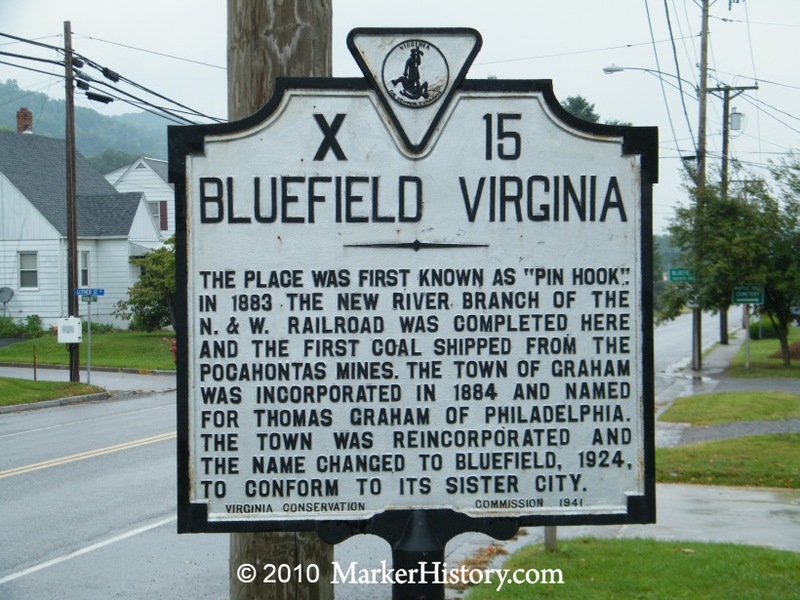 The town of Bluefield came to be by 1889. Newspaper accounts say the land prices in the Virginia town of Graham had skyrocketed once word got out the railroad was coming. Higginbotham’s Summit, in the West Virginia side had the space for rail yards, and the land was much cheaper there, so the railroad made the switch to the West Virginia land, and developed a strong presence there, drawing businesses and residents. By the 1920s the two communities were receiving some unprecedented growth. The coalfields were bringing in the money and the railroad was serving as a hub for passengers, freight, and coal. The area was booming. Baptists in the Commonwealth of Virginia wanted to establish a college in the region of southwestern Virginia. They were courted by business and community leaders from Bluefield and Graham. This effort was successful and the Bluefield College was established in 1922, a building was built and students welcomed to campus in the fall of 1923. In December of that year the paper published a column in which a conversation was reported to have been engaged in at a local Graham business during which a debate ensued about changing the name of the Virginia town of Graham to Bluefield, honoring the college they hosted on Virginia land, and bowing to the powerful presence of the much larger community of Bluefield, West Virginia. The conversation consumed the town and the newspaper for months. Legislation was offered in the General Assembly allowing for a special town election to decide the question. A long list of supporters of the name change was published in the Graham Daily News section of the Daily Telegraph, noting many of the leading families of the community were in favor of this change. The election came and went and Graham was renamed Bluefield. In July of 1924, about a month after the town election, a mock “Wedding” was staged at the state line, with governors of each state being present, and a couple took the vows of matrimony, representing a marriage of the two communities. Of course they kept their own governmental oversight, but the spirit of the community became one that day. The schools kept the name Graham, as did some of the churches and businesses. A letter was published from a descendant of Thomas Graham, saying the family was in favor of the name change but that they thought the community should work hard to diversify their industrial base so the community would prosper into the future. The newspaper editor suggested building a monument to Thomas Graham’s influence upon the community. Nothing was done about this suggestion. Graham had died in 1891 on a trip to Mexico where he was inspecting some copper mines. His sons ran the Graham Land and Improvement Company in the town for several years, but neither became permanent residents. This Friday and Saturday the two Bluefields will celebrate 90 years as two communities with the same name. Its a good time to celebrate, even though the demise of the coal industry has brought the West Virginia community to a position of only being a shadow of its former self. The old town of Graham, now Bluefield, Virginia, has kept a steady population all these years. This entry was posted in Uncategorized and tagged Baptist, Bluefield, Bluefield College, bluestone, Bluestone river, chicory, coalfields, community, flat top, General Assembly, governors, Graham, marriage, Pin Hook, Thomas Graham, Virginia, West Virginia. Bookmark the permalink.